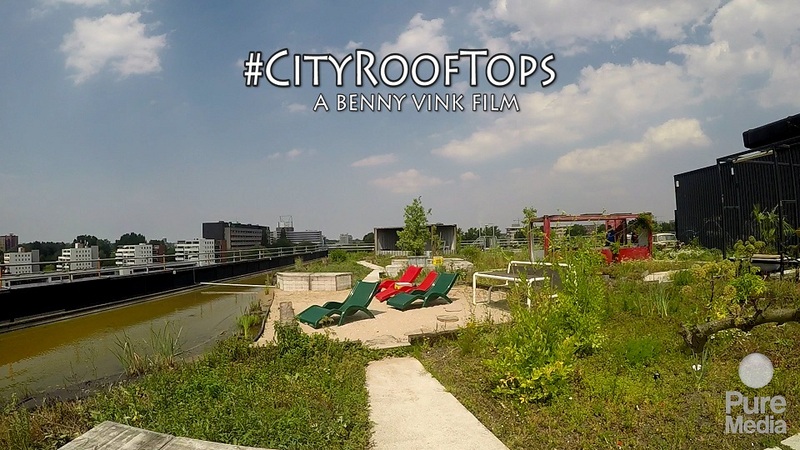 Since September 2014 Pure Media is following designer and plant specialist Philip van Traa for the documentary CityRooftops. On Wednesday the 11th of March we sat down for an interview Philip van Traa. Set in one of his favorite locations, Philip van Traa shared his story and his heart. But before doing so, some preparation was necessary. Benny and I arrived early to check out the location. As we brought all the gear up, a buzzing sound was very much present on the huge open floor where the interview would be. Benny wanted this interview to be one of the high points in the documentary - so everything should be of the highest quality, including the sound. If you remove this kind of buzz in post production, voices start to sound unnatural and 'tinny' - and that's not what Benny wanted. We found the machine that was causing the buzz was the air ventilation system for the toilets. Then we asked the people at the location if we could switch it off for the interview, and that wasn't a problem. After that we set up the camera, lights and microphones, getting them ready to go and invited Philip van Traa to sit on a chair and share. Philip van Traa shared how he got involved in this project and about his desire to simplify. Then, by applying various simple solutions to a garden rooftop in the city, seemingly small solutions could add up to a big impact on city life. In large cities, heat and smog are known problems. Smog comes from traffic and a lot of the traffic in the city is food related. So when food is grown on rooftops in the city, there's less food traffic and less smog. But there's also less smog because some of the plants are capable of retaining some of the emission. Besides food and smog, green city rooftops can help cities with water retention. When there's heavy downpour, flooding could be likely as the water management is more controlled. Coming back to the heat issue: green rooftops with some kind of water retention absorb the sun's heat better than plain rooftops. And that's how rooftop gardens, by reducing smog, retaining water and absorbing heat, can have more impact on a city's climate than one would expect at first sight.